Even when a man is in a happy relationship, it can be difficult to remember all the important dates, the forgetting of which makes it likely you'll be left with nothing but your palms. Let your phone handle all the remembering, with MANsaver. 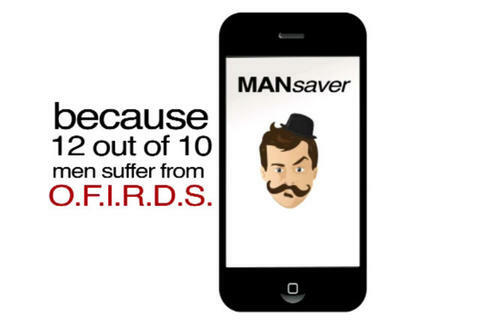 Designed to keep you in your lady's good graces against all odds, MANsaver's an app that saves you from what they term Often Forgetting Important Relational Dates Syndrome, by alerting you to all "key relationship milestones", which's also great advice if you buy your gf a car, and she breaks up with you. Start by saying if you're married or just dating, plus when you started seeing each other, and it'll instantly generate a calendar and fire you notices five days in advance of love-minded holidays ranging from critical (V-Day) to lesser-known brownie point-scorers like "Cuddle Up Day" and "Letter Writing Day" -- the one day she'll allow you to get some mail bonding. You'll also be alerted to personal benchmarks, from your first month together, to such shameful cheesiness as 111, 333, 777, and even 1,234 days together, at which point it's probably time to pop Wilson the Volleyball, and build a raft. MS'll also put extra effort into your faux-romanticism by using its "suggested text" function, which offers syrupy messages to go along with your date reminders, such as "If hugs were leaves, I will give you a tree", although once she figures out you didn't even write such beautiful poetry on your own, you'll be getting some of her palm, too.